Home Universities AMU AMU Application Form Status 2019 – Check Here! 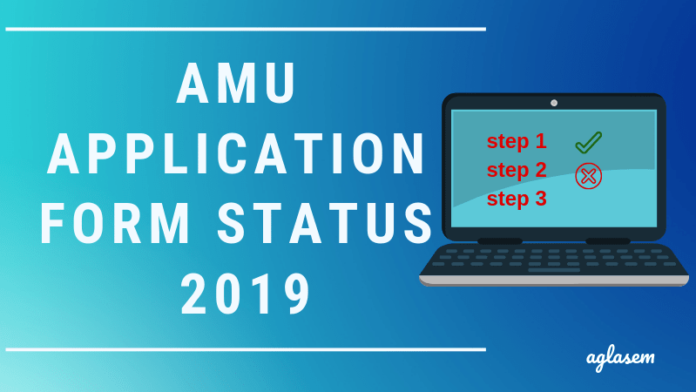 AMU Application Form Status 2019 – Check Here! AMU ApplicationForm Status 2019 – Candidates can check the AMU Application Form Status 2019 by logging into amucontrollerexams.com. It is advised to check the application status after one has filled the AMU Aplication Form 2019. Details of whether the form will be submitted and other intimation will given when candidates check application status. Also, application number will shown on logging in, which should be kept safely for download of admit card and checking result. Those who will submit the application form of AMU 2019 can check status through candidate login.If the form was submitted in offline mode by hand, then an Acknowledgement Slip may be given. 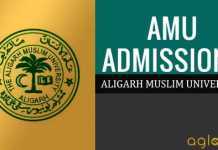 AMU has released the AMU 2019 Application Form in February. Simultaneously it will make application status check login also becomes active. Candidates can check AMU Application status,with the help of their App. No., Roll No. and other essential details from the link provided below. The candidate has to enter username and password for signing in to check application form status. Application Status: AMU Application Form Status 2019 will be available at official website www.amucontrollerexams.com. After completion of each step, a candidate is asked to check their AMU Application Form Status by logging in to their portals. 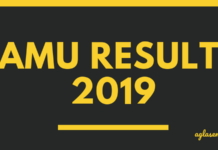 It is important to keep your AMU application 2019 form status correctly updated, as the University will be accordingly processing your applications. All those candidate who are not able to complete their application process on time, will not be considered as an eligible candidature. In case, you have completed all the application step and the status shows, you haven’t. In such a situation, you are requested to wait for atleast a day. If the status remains unchanged, then contact the authorities over their helpline number and get it rectified. A candidate whose qualifying examination is not recognized by this University shall not be eligible for admission. All such Application Forms/admissions shall be rejected/cancelled. For all courses where Selection Process is based on (or has a component of) candidate’s performance in the Qualifying Examination, the candidate must submit self attested photocopy of his/her mark sheets / grade sheet of Qualifying Examination (both sides) so as to reach in the respective offices as given under each course of study up to 5:00 PM on or before the last date failing which his/her Application Form will be summarily REJECTED. Received after the last date. No correspondence shall be entertained in this regard. No relaxation in the last date shall be granted. The University takes no responsibility for postal delay or non-receipt of Application Forms or any other communication related to admissions. The AMU entrance exam roll number will be a multi-digit number unique to each candidate. Application No./ R.No./ Transaction ID should be quoted for all queries or correspondence and at the time of submission of required documents. The documents submitted without mentioning Application No./ R.No./ Transaction ID will not be considered. A candidate shall be eligible to apply for admission to a course of study if he/she has passed the qualifying examination and also fulfils all other eligibility requirements in terms of subjects studied, the percentage of marks, age, etc. The percentage of marks secured by a candidate at the qualifying examination, falling short by even a decimal fraction shall not be rounded off to the next whole number. Similarly, if the age falls short or exceeds even by a single day, the candidate shall not be eligible for admission. Applicants whose application forms have been rejected may please note that on the remarks column, reasons for rejection may be mentioned in the Rejection List. If they wish that their Forms be considered they should comply with the requirements and send the same by last date given by AMU. This facility should not be considered as the matter of right of the candidate. AMU will try to remove the discrepancy to the extent, and no claim will be accepted if the discrepancy caused by the candidates themselves are not removed. 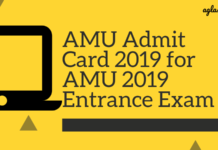 After the AMU 2019 application formalities have been completed, a candidate is then asked to take a printout of the admit cards for the exam from its official website. Usually, the admit card are issued in the month of March or April, every year. Candidates need to select teh course, that they had applied for, enter their application number and click the “submit” button to download their admit cards. There are slight chances of that a candidates doesn’t receive the admit cards in online mode. In such a situations, he/she is advised to contact the authorities over email on [email protected], mentioning their Transaction ID, Name, Telephone Number and the Courses.